While refusing to see shades of gray can be a person's downfall, sometimes it's exactly what the beauty doctor ordered. 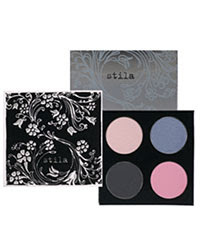 Case in point: Stila's new, limited-edition Blanc and Noire palettes. The palettes themselves are absolutely, undeniably gorgeous -- felt tops are festooned with sweeping flowers and vines that evoke a romantic, boudoir sensibility. 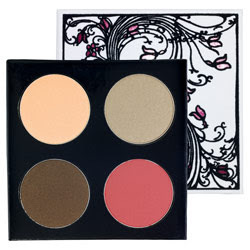 Once opened, each reveals three eyeshadows (base, crease and liner), as well as one cheek color. Blanc contains shadows in shimmering golden beige, sparkling copper and gold-flecked espresso and a rosy cheek color, while Noire offers shadows in glimmering pale pink, glittering blue-gray and glistening charcoal and a mauve cheek color. Whichever you choose, you're sure to be the belle of the ball. But act fast, as they won't be available for long! Each is available on Stila's website for $32. What do you know -- sometimes things really are just black and white.